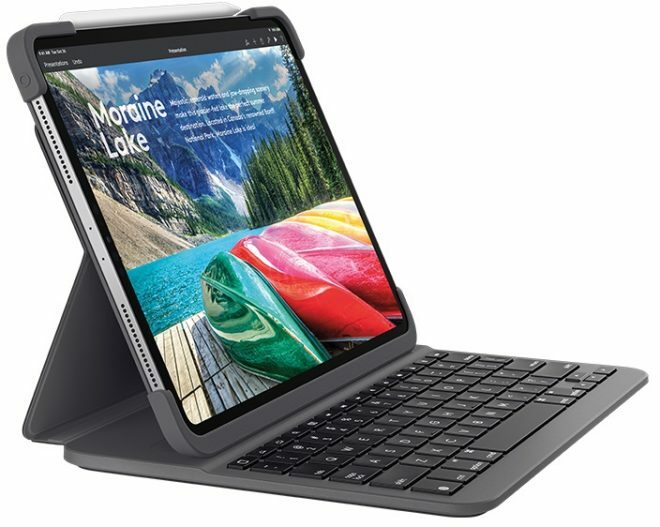 Logitech makes some of the best keyboards for iPads in my opinion, and today they announced that they are about to release new Slim Folio keyboards for the 2018-219 model iPad Pro 11 and 12.9, with the full name of these two keyboards being Logitech Slim Folio Pro. One thing I immediately noticed was that these covers are more sturdy than the other keyboard covers out there, which means that they offer more protection for the somewhat fragile iPad Pros. So it’s great that Logitech incorporated some additional protection for the tablets along with the new keyboard. There’s even partial protection for the Apple Pencil underneath the latch. The keyboard is backlit in 3 levels of brightness, and features a 180 hour battery life. It connects to the iPad Pro via Bluetooth, and has three modes, with the first one being type mode, the second being sketch mode where the iPad rests relatively flat but stil tilted towards you, and finally there’s read mode when the keyboard is folded behind the iPad. The price for these keyboards are $120 for the 11-inch model, and $130 for the 12.9-inch model. Logitech belives they can release the Logitech Slim Folio Pro now in April. Logitech also pulled a April Fools joke yesterday where they took to the initiative of renaming the wireless mouse to hamster instead.